This burger is over 6 years old, and you’d have thought the hype would have died down already. This burger is still as highly recommended on the food internet; indeed, it has even been elevated into an icon of the Boston food scene. Articles by Eater, Boston Magazine, a cover on Bon Apetit Magazine, and more, all attest to its greatness. But when was the last time that this icon was objectively reviewed? Instead of accepting its greatness, I felt it was my responsibility as a foreigner to the Boston food scene, immune to the hype and build up, and see for myself. If you know anything about this burger, you know that they only serve 18 every night and only on the bar side of the restaurant. Thus, I specifically called two nights before asking for a reservation on that side of the restaurant. Dedication, if I do say so myself. I went on a rainy Sunday. It was a good day for a burger, the sort of day when you just want something warm and comforting, classic but not boring. But seriously though, the service was friendly and efficient. The restaurant is small, which makes it easier for the staff to look after you properly. They are knowledgeable about the menu, and willing to offer their opinions if you ask, which I always do. PRO TIP: Sit on the bar side and get access to the full dining room menu as well as the more affordable bar menu. And the burger, of course. The bread basket, by the way, was excellent. I judge a restaurant by its bread basket, because it’s an integral part of the experience. It the restaurant serves stale, inferior bread, it might as well not give anything at all. I’d rather not have bread than regret biting into a dense, coarse brick. Thankfully, Craigie’s 3 varieties, a lovely crusty French baguette, a more ciabatta like roll, and a flax-speckled, nutty multigrain, were all fabulous. My favorite was the multigrain with flax for its depth of flavor, though you can’t go wrong with the other two. We also order the octopus. It was a solid dish with a nice punch of flavor, a sort of smoky paprika flavor that worked well. Was it mind blowing, stunning, omigosh I’ve never eaten anything better in my life? No. But I think it was the only time in my life that I’ve had octopus cooked perfectly, absolutely ZERO chewiness. And that is admirable. Now, onto what you’ve been waiting for: the burger. This restaurant has a burger cult following. An hour into our meal, having arrived the moment the restaurant opened, we hear the bartender call out: “only one burger left!” and the entire restaurant cheered. Clearly as popular as ever, this burger sold out within two hours of opening that night! And it must be a very complex burger, because it took forever to come out, long enough for me to go through an entire bread basket (because I’m a carb-lover and I’m not ashamed). I waited patiently, and it finally arrived. Let’s just stop and appreciate that for a moment. It’s definitely a looker, is it not? Now, the most important part: taste. It was good, because how can a burger be bad? But was it the transformational experience that everyone promised? No, not really. Everything, the bun and the bacon and the grind of beef, are all made in house. If you’re going to make it in house, you would do well to make it less generic in my opinion. The bread was good, but it wasn’t special. Why not make the outside crispy if you can, and the inside soft and pillowy? A nice squashy bun is lovely and works, but I could get the same at the supermarket, even organic at whole foods. The bun was good, sure, good quality and it held its shape and structure reasonably well, but that’s all. The ketchup was fine, a nice spice to it, not memorable. I’m also not a ketchup person. The meat was very, very medium. It lacked a good sear, and was quite pink throughout the center. The flavor was also lackluster. If they’re not going to have enough salt and seasoning, at least make sure the beef grind has enough complexity to stand alone. But it was just a temperate beef flavor, which was fine as I personally like the taste of meat. But if could have been better, you know? The cheese I couldn’t even taste, so I can’t really judge, but the lettuce and other dressings (a sort of pickled onion) were nice. That’s sort of all I can say. Nice. The bacon, which was house cured, was also good. Again, good. Not great. But good. The salad complimented the burger, but was by no means necessary. The fries, to my surprise, were excellent! Big, chunky wedges cooked perfectly, with a soft creamy inside, a super crispy, crackly outside, and aggressive but refined seasoning. Why couldn’t the burger be cooked like this?! Go to Craigie on Main if you can afford the splurge, but ignore the hype and get something more interesting. Go for the bread, the staff, the chance to try something awesome. The menu has so many interesting ideas. phytoplankton garganelli? What is that? duck rilletes? Sounds very classical French but I’m sure they’ve taken an innovative spin on it. I, personally, will be back for the whole pigs head. At 9am on a Thursday, I was a little surprised to see five Harvard students grinning as they stretched and turned (and stretched and turned again), a batch of sticky bread dough. This gooey mass, after it has risen and been braided, will become the sweet bread Challah, a traditional bread served at Shabbat dinner, or the Friday evening meal of the Jewish day of rest. But the bread is not for them –save for a few furtive bites. Headed by sophomore Amanda Jowell, Harvard’s Challah for Hunger mixes, bakes, and sells freshly baked Challah every Thursday evening at Hillel starting at around 6pm. The proceeds all go to MAZON, an advocacy group that works to bring nutritious food to the hungry in both the United States and Israel. And so far, so good: within the first four weeks of selling, Challah for Hunger has already raised more than $500. The original organization founded about a decade ago, Challah for Hunger now exists on over 70 different campuses across the US, Canada, Australia and England. Jowell got the idea to bring CfH to Harvard after her twin sister started an outpost of the group on Stanford’s campus. Supported by Hillel, Jowell was able get the supplies and manpower together, and is now even able to offer different flavors of bread in addition to completely kosher Challah. As someone who had never heard of the bread before, I had to ask: why Challah? The answer is quite simple. At Shabbat dinner, Challah is something expected, as the dinner usually begins with a blessing over two Challah loaves. In this way, the goal of CfH is to come together as a community to aid those who ultimately cannot take Challah on their dinner table for granted. Making bread from scratch is a pretty serious time commitment (especially for a Harvard student), so it is only through community that the Challah makes it into the oven each week. The Challah making process consists of four main parts: 1) mixing/kneading, 2) rising, 3) braiding, and finally, 4) baking. Following the procedure Jowell had already perfected by the second week of production, the process begins at 9am when about five to six Harvard students get their hands dirty combining the ingredients and kneading the dough. essential for achieving the coveted caramel brown on top of the loaves. Finally, the Challah goes into the oven, and is still warm when it is sold to the line of people already lined up and waiting for the bread to arrive. At just $5 a loaf, the braided beauties are sold out within minutes. Just one bite into these pillows of soft, sweet dough, and you’ll know why. Why Did the Turkey Stop Eating? He Was Stuffed! Thanksgiving is easily a foodie’s favorite holiday of the year. While my day-to-day life revolves around the foods I’m eating for breakfast, lunch, and dinner, Thanksgiving is the one time of year when everyone else does the same. We begin looking into airline fares months ahead of time when making our holiday plans, and then spend at least a week or two carefully selecting Thanksgiving recipes and entering the grocery store madness just to eat together as a family. My family sticks to the traditional foods for this annual event: turkey, stuffing, rolls, cranberry sauce, mashed potatoes, sweet potato casserole, and green beans (and a countless number of pies and other treats). Unfortunately, they don’t like straying from the recipes they’re used to either. 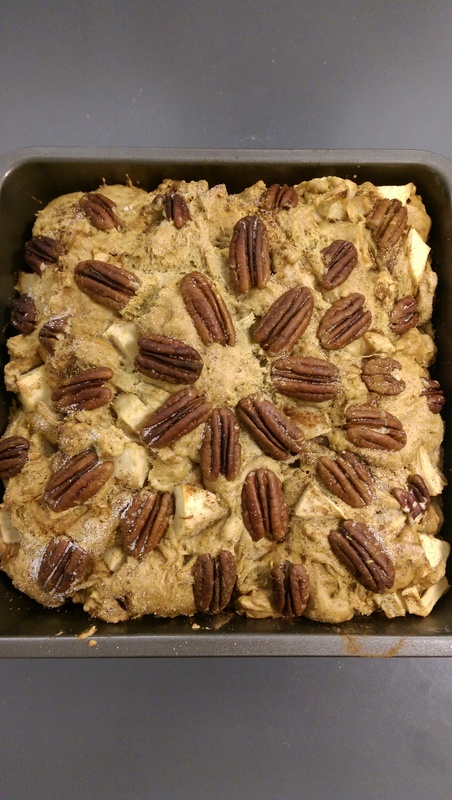 However, after years of box-made stuffing, I decided to try out a new recipe for Thanksgiving this time around. I found the recipe for “Save-the-Day Stuffing” online (a.k.a. homemade stuffing with a few healthy swaps) to lighten everyone’s plates this year. I used the typical veggies but included light bread and liquid egg substitute, and ended up with a pretty tasty addition to our household’s Thanksgiving repertoire. Leave bread uncovered at room temperature overnight. Otherwise, begin by lightly toasting bread. Cut bread into 1/2-inch cubes. Spray a medium baking dish with nonstick spray, and place bread cubes evenly along the bottom of the dish. 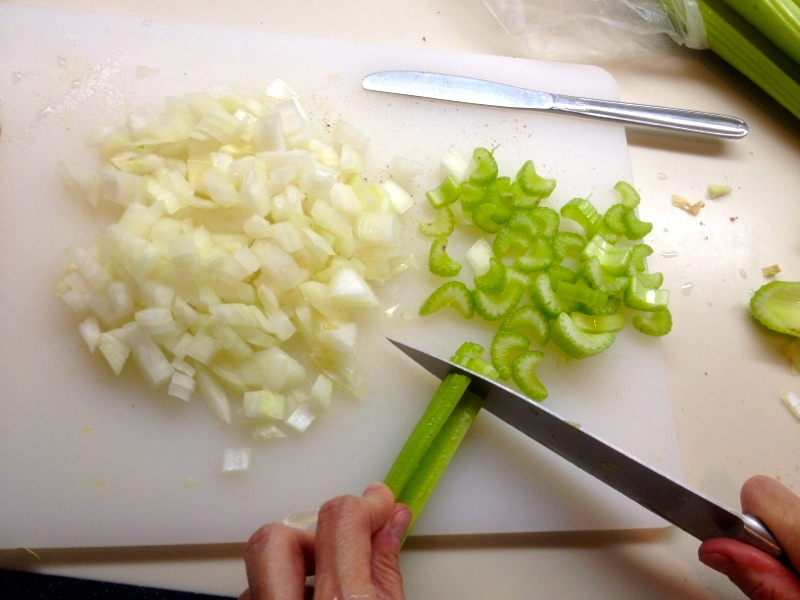 Chop up the celery and onion to prepare it for the stuffing. 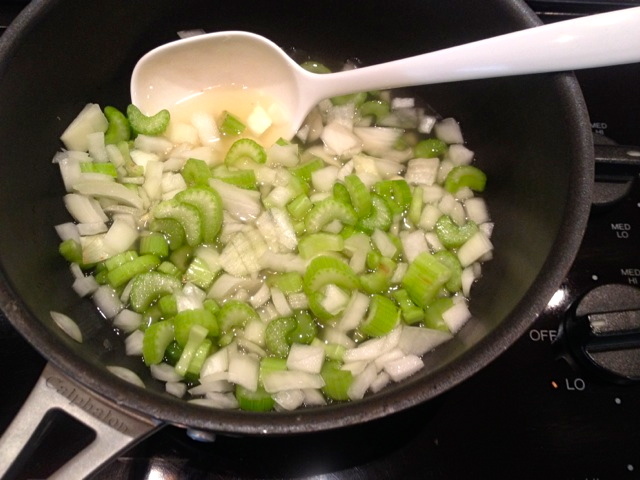 In a medium pot, combine broth, celery, and onion. Cook for 8 minutes over medium heat. Remove pot from heat, and add mushrooms and garlic. Season mixture to taste with salt, pepper, rosemary and thyme. Let cool for several minutes. Add egg substitute and butter to veggie/broth mixture and stir. Pour mixture into the baking pan, evenly covering bread cubes. Mix gently with a fork. 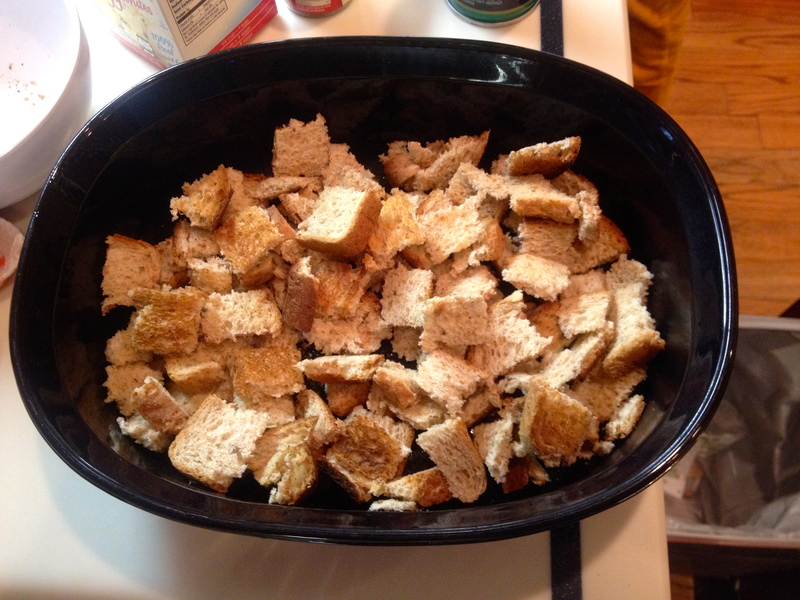 Bread cubes should be moist, but not saturated (if necessary, add 1 – 2 tbsp. water, and then mix again). 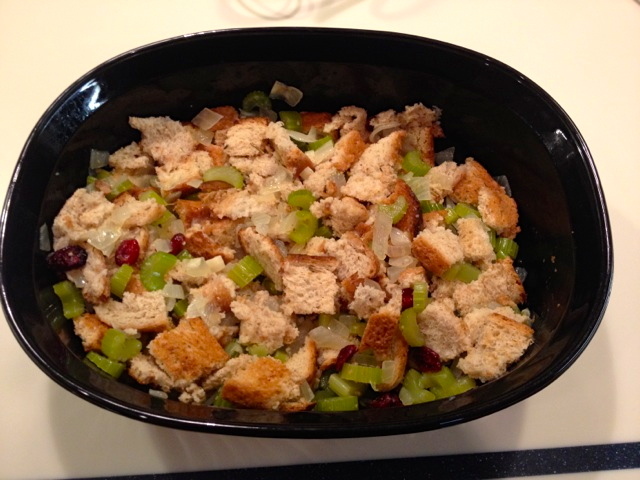 If desired, throw in the dried cranberries to add a sweet kick to your stuffing! Cover with foil, and cook dish in the oven for 20 minutes. Remove foil, and fluff and rearrange stuffing. Return dish to oven (uncovered), and cook for an additional 15 minutes. After comparing my homemade stuffing to the boxed one we have had at our Thanksgiving table in years past, I was impressed. This version had more flavor and texture, though I admittedly added in more chicken broth than the recipe called for after noticing it looked dry before putting it in the oven. I found the stuffing recipe, along with quite a few other holiday dishes at www.hungry-girl.com, one of my go-to websites for healthy sides, entrees, and desserts that are just as tasty as the original version, yet far more nutritious and lower in calories and fat.